Design your own incredibly soft and functional Minky Baby 2 Toddler blanket. This is the perfect size to go from newborn through the toddler years. Choose your colors and we'll create a custom handcrafted Minky Baby 2 Toddler blanket for that special bundle of joy in your life! Functionality meets fashion with this scrumptiously soft handcrafted Minky Baby 2 Toddler blanket. 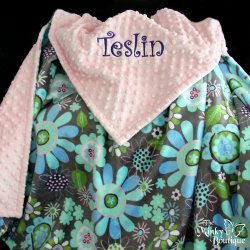 Your baby will be stylish and beautiful as well as snuggly warm wrapped in this double-sided Minky blanket. This blanket's generous size can easily be used through the toddler years. Each blanket comes folded, bowed with tulle and wrapped in tissue. Click on the drop-down arrow for top, bottom, and border colors and choose from any of our beautiful fabrics. The Minky border on this blanket will be a 5" strip of coordinating Minky fabric of your choice at each end of the blanket on the "Top" side. If you do not wish to have a border, simply click "No Thanks" in the drop-down border box. Satin ruffle trim is a satin ruffle around the outside of the blanket. Scroll to the bottom for easy viewing of all our fabric choices. Choose your colors....we'll do the rest! Make your gift more unique and special with professional personalized monogramming! 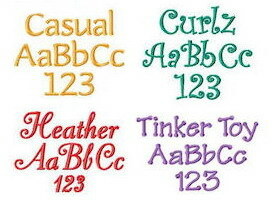 Monograms on our baby blankets are 1.5" - 2.5" depending on the font and can be one or two lines. Type the name you want monogrammed in line 1. If you wish to include a birth date, type the date in line 2. The date will be centered directly under the name. Unless specified otherwise, all monogramming will appear diagonally in the lower right corner of blanket.